Featured in The New York Times Cooking section - Title, A Field Guide To The American Sandwich. The History - this decidedly Southern sandwich with Northern roots, pimento cheese is a simple mix of Cheddar, red bell pepper and mayonnaise that touches both the upper classes and the lower. In the early 1900s, American cooks in the North began mixing imported canned Spanish pimento peppers with cream cheese or Neufchâtel to make a fancy snack. Food manufacturers quickly took up the notion, and by the 1920s, farmers in Georgia and California started growing pimentos to feed the demand. Southerners, awash in peppers, made a version using that country store staple, hoop cheese. As the South moved from an agrarian society to an industrialized one, pimento cheese sandwiches filled lunch bags and factory “dope carts,” which also sold Coca-Cola and headache powders. 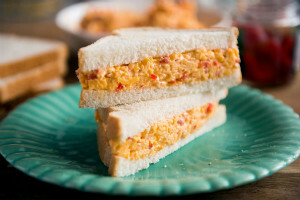 It remains a perennial offering at the Masters golf tournament, a mainstay of afternoon tea menus and a refrigerator staple in many households, where it is essentially the peanut butter of Southern childhoods, according to Emily Wallace, a pimento cheese scholar. The best versions are on white bread, with a hand-grated mix of sharp and medium Cheddars, just enough mayonnaise to hold it together, judicious distribution of finely chopped roasted red pepper and a kiss of cayenne. Enjoy! In a large mixing bowl, place the cheddar cheese in an even layer. Scatter the cream cheese, pimentos, mayonnaise and chile flakes over the cheddar cheese. Using a spatula, mix the pimento cheese until it is smooth and spreadable, about 1 1/2 minutes. Transfer the pimento cheese to a plastic container or bowl, cover tightly, and store in the refrigerator. Pimento cheese keeps in the refrigerator for 1 week. Yum!